Yesterday we started to dig into this humdinger of a contract. It is, in a word, bad. But bad things are often great teaching devices! They help us see very clearly why to do things in a particular manner or how to better approach a situation. This contract will likely be my most favorite teaching device, ever. Rule #1: A stranger should understand every contract you sign. Rule #2: Read a contract like you’re editing a story. Rule #3: Words mean things; explain what you mean when you use them. Rule #4: If math is important, show your work in the contract. Today we’re going to tackle four more rules that will hopefully help you feel more confidant navigating contracts. Rule #5: Do not sign a contract if you do not understand how you will be paid. OK. 30 days from the day the comic is released in stores where? The US? The UK? Canada? Japan? The Moon? Also, what do the payments consist of? Because if they consist of “profits” how the heck can they begin 30 days from the day the comic is sold in stores somewhere in the universe? How in the world can something make a profit so quickly? A lot of folks can be intimidated about asking after how they’ll be paid; our cultural programming tells us that this is somehow rude. It is not rude; it is necessary. You must must must understand how you will be remunerated for a project. If you do not understand how you will be paid and you sign the contract anyway, you have to be OK with the fact that you might not ever get paid for the project. If you’re OK with doing the project for free, and there are legitimate cases when that might be true, sign away! If doing the project for free will cause pain and suffering, politely decline. Rule #6: If you are a freelancer, you are not an employee. This isn’t as generic as our other rules, but it’s very important if you’re a freelancer. Sure, freelancers can become employees for the company they are working for. But to do that they have to stop being freelancers. You cannot simultaneously be a freelancer (independent and working for yourself) and an employee (working for and at the direction of another) for the same company. It is a legal impossibility. If you see the word “employee” in your contract and you are acting as a freelancer, raise a sharp eyebrow. Being an “employee” vs. an “independent contractor” has legal implications that can affect everything from your intellectual property rights to taxes. I do not know which status is better for your situation, but I do know that they are mutually exclusive. Rule #7: Contracts should be written in plain English. Fellow readers of the English language: W.T.F.? 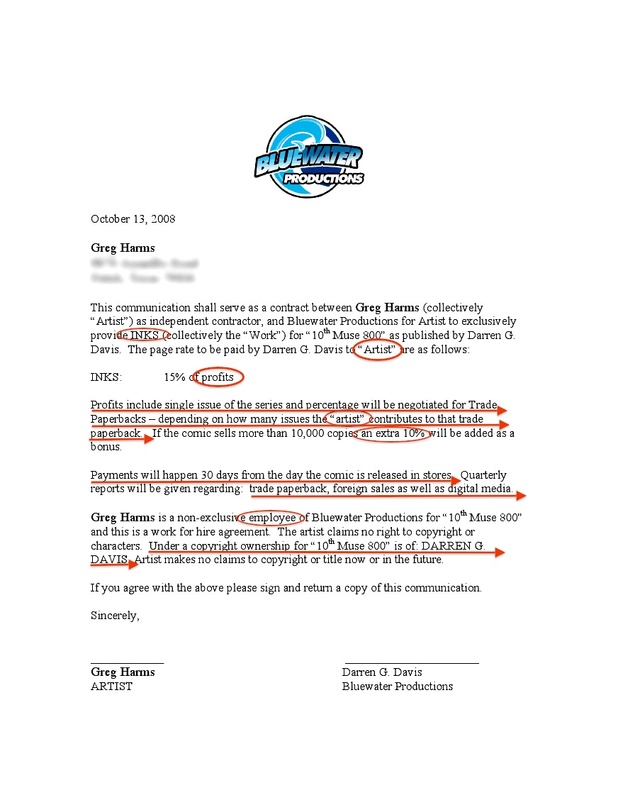 My guess is that the drafter meant to say, “Darren G. Davis owns the copyright in ‘10th Muse 800.’” But by attempting to make it sound “more official” the drafter just introduced additional, unnecessary confusion into the document, which hurts everyone. A contract doesn’t have to “sound legal” for it to be enforceable, but it does have to make sense. Finally, Rule #8: Contracts shouldn’t make you feel bad about yourself. I’m sort of being picky with this last one; it comes from the fact that the word “artist” is put in quotation marks each time it’s used. From there on out the quotation marks aren’t used (you don’t need ‘em; the word’s defined) but it is important to always use that word in that particular manner. So if it’s capitalized the first time, it’s always capitalized; if the first time it is used it identifies me, it shouldn’t later be used to identify you. In all seriousness, contracts are pieces of paper that represent a relationship. If the contract makes you feel gross or under appreciated or just plain bad, there is something wrong with the relationship. Address what’s wrong before you sign that piece of paper. And those, my friends, are (some of) Katie’s Rules for Reading Contracts. Got a question or think I’m full of it? Both the comments below and my email above work equally well. These entries are some of the most useful writing I’ve ever read. Anti-legalese, if you will. Thank you, Brendan! I had a LOT of fun writing them; I’m glad to hear that they’re useful.